During my brief time here at the NOAA Office for Coastal Management, I’ve been lucky to get to work with CanVis to supplement the Sea Level Rise Viewer. CanVis is a really cool visualization tool developed by the U.S. Department of Agriculture’s National Agroforestry Center. It allows users to “see” potential impacts of development and natural processes by inserting objects (docks, vegetation, buildings, etc.) on top of a background image to create a photorealistic image. I was first exposed to CanVis as a graduate student at East Carolina University. My colleagues, Michelle Covi, Brent Gore, and Travis Hill, and I were working on a project that aimed to more effectively communicate and visualize sea level rise vulnerability in the Albemarle-Pamlico Estuarine System in North Carolina. Naturally, we thought that CanVis simulations would be a great addition to the maps that we created, because we could really see what the effect of sea level rise would look like in locations that they were familiar with. Unfortunately, we came across a huge bump in the road. 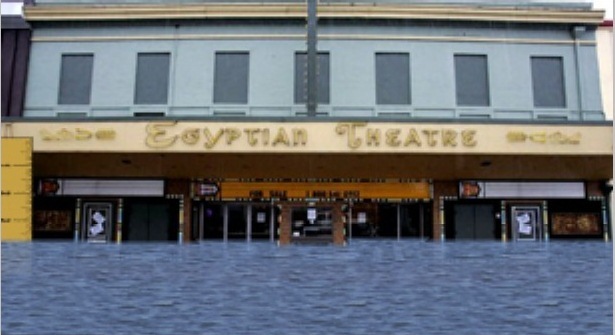 None of us knew how to accurately simulate sea level rise at set increments. 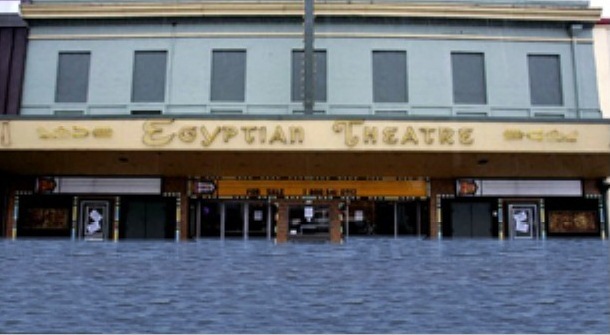 This was a big problem because in an area with low elevation like coastal North Carolina, a few centimeters of sea level rise is the difference between a small amount of land loss and widespread inundation. Because we were unable to create credible sea level rise simulation visualizations, we ultimately decided to scrap using CanVis. And our zealous plans to travel the North Carolina coast to take pictures of landmarks and historic waterfronts (and catching some waves, time permitting of course) went down the drain. It turns out that if my colleagues did a better job of research, we would have found that there is a scale tool in the Drawing Aids Library. This handy tool is calibrated to an actual ruler and allows the user to base relative measurements off a known object and would have made simulating sea level rise very simple. The scale bar can be moved next to any item in the picture and resized. I chose to use a poster at the front of the movie theater (Figure 1). The typical movie theater poster is approximately 40 inches; I sized the scale bar so that each unit is 20 inches based on this assumption. 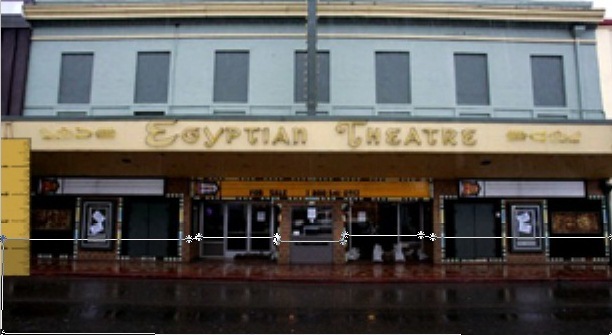 Therefore, to show a 2 feet inundation, water heights need to be at 1.4 units on the scale bar. The scale bar needs to be moved to the edge of the image and placed where the bottom aligns with the ground. 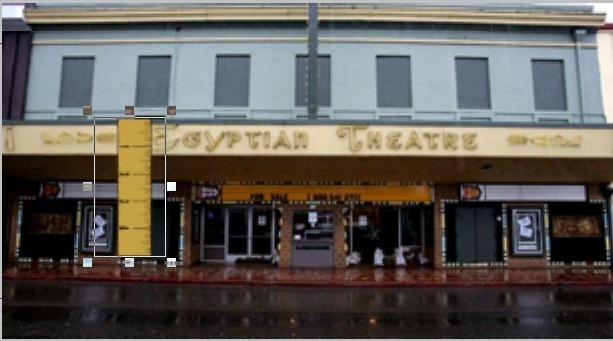 All that’s left to be done is to use the Area tool to outline the inundated area (Figure 2), and then use the Perspective Library to fill the area with an appropriate water texture (Figure 3). It’s really that easy. And by using this simple methodology, we would have been able to create more credible inundation simulations than just eye-balling the water level (Figure 4). This brings up another very important issue with using CanVis, which is maintaining credibility with CanVis and creating visualizations that are as “real” as possible. The guidance document Using Photorealistic Visualizations outlines the three A’s of being credible: Accuracy, Accountability, and Accessibility. In addition to following the three A’s for credibility, it is important that the image looks real (USDA National Agroforestry Center 2006). This can be achieved by adjusting the colors, texture, and lighting of the image, as well as adding relevant objects such as vegetation, animals, people, or structures. It is important to not get too creative with this aspect of CanVis. It will be hard for anyone to accept a sea level rise simulation if there are giant Labradors and UFOs hovering over orange water (Figure 5). Thankfully, there are many resources that address these issues and more on the Support section for the CanVis tool. U.S. Department of Agriculture, National Agroforestry Center. 2006. “Photo-Realistic Visual Simulation: An Agroforestry Planning Tool.” Authors: G. W. Wells and G. Bentrup. Agroforestry Notes. Number 30: 1-4.